Forced to make her own way in the galaxy since her teens, Jyn Erso had little reason to trust anyone until being drawn into the Rebel Alliance by Cassian Andor and the rest of the Rogue One strike team. She found new meaning alongside these new allies, ultimately sacrificing herself to secure the Death Star plans and ensure the survival of the Rebellion. 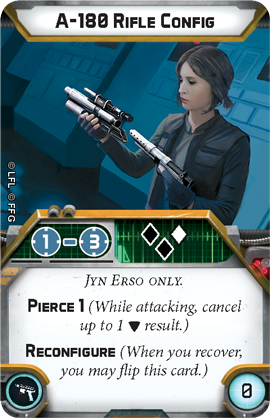 Order your own copy of the Jyn Erso Commander Expansion at your local retailer or online through our website today! Although her time with the Rebellion was short, Erso’s contribution to the Rebel cause was significant. In addition to playing a leading role in stealing the Death Star plans, she also helped the disparate factions of the Rebel Alliance coalesce into a unified fighting force for the first time. 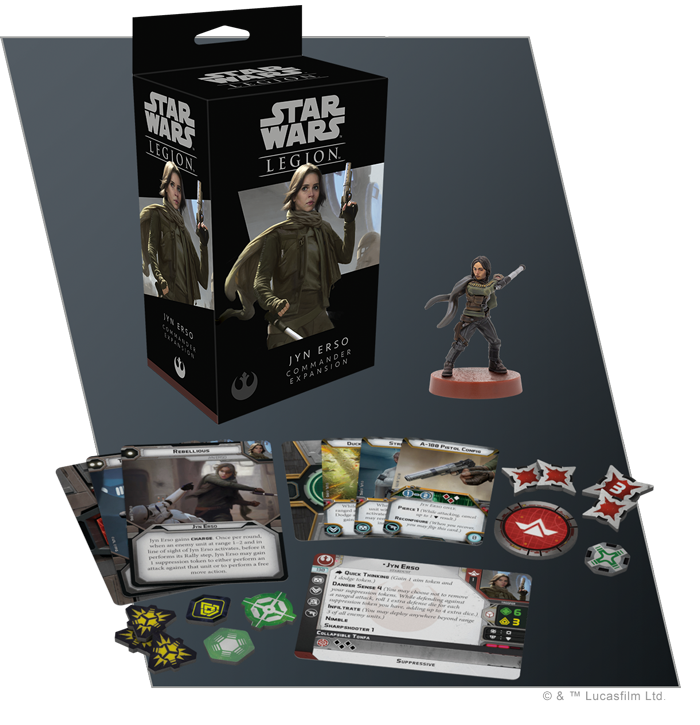 Soon, Jyn Erso will be able to lead your Rebel strike teams into the battles of the Galactic Civil War with the Jyn Erso Commander Expansion for Star Wars™: Legion! 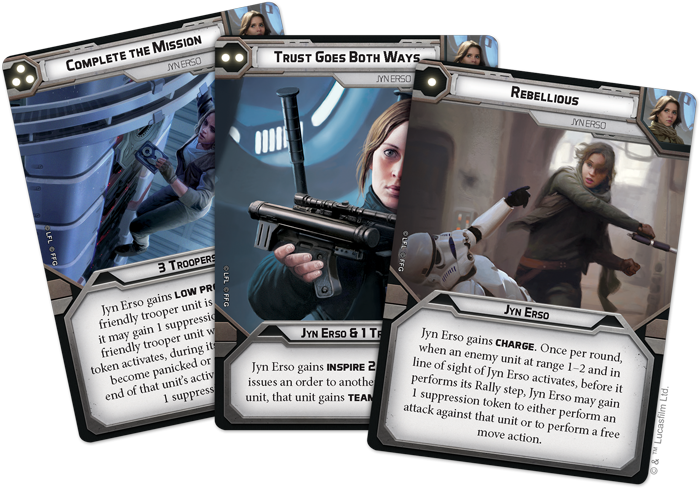 With this expansion, you can employ Jyn Erso’s unique skills on the battlefield while shaking up your strategies with her three signature command cards. Beside the beautifully sculpted, easily assembled Jyn Erso miniature and new unit and command cards, this expansion also contains five upgrade cards that enhance her natural abilities. 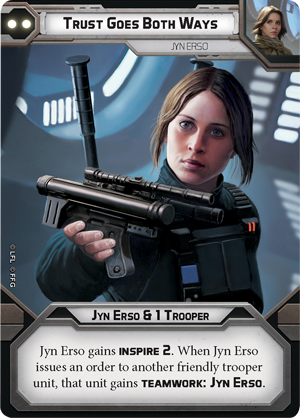 Join us today as we take a look at everything Jyn Erso can add to your Rebel armies! Jyn Erso’s military upbringing has been anything but conventional. Much of her youth was spent learning guerrilla tactics under the extremist Saw Gerrera and, since being abandoned by him, she has focused on developing only the skills that help her survive in a hostile galaxy. The sum of these experiences is a 130-point commander just as adept at avoiding damage as she is at doling it out. 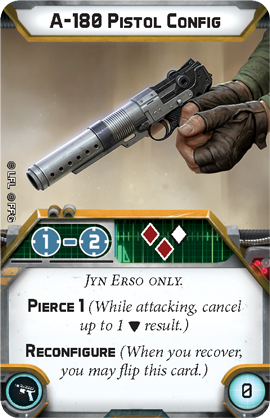 Life on the fringes of the galaxy has forced Jyn Erso to be prepared for anything, and she can exhibit Quick Thinking in almost any situation, allowing her to gain one aim token and one dodge token for a single action. Naturally nimble, the dodge token she gains from this action will be particularly useful, helping mitigate a bit of enemy fire no matter how many times she’s targeted. Better yet, in addition to being able to make split-second decisions in the middle of combat, Erso has an uncanny knack for knowing when she’s about to be attacked. 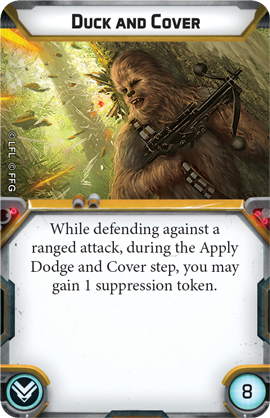 This Danger Sense gives her the option to keep her suppression tokens and roll an extra defense die for each one. When combined with her ability to convert defensive surges into blocks and an upgrade like Duck and Cover, Jyn Erso is a particularly difficult commander to hit. Far from being content using these defensive abilities on the fringes of a battle, Jyn Erso prefers to fight alongside her troops directly in the thick of the action. Her Infiltrate ability all but ensures that she’ll be able to trade fire with enemy forces from the very beginning of the game and—as a Sharpshooter—she can make her shots count. 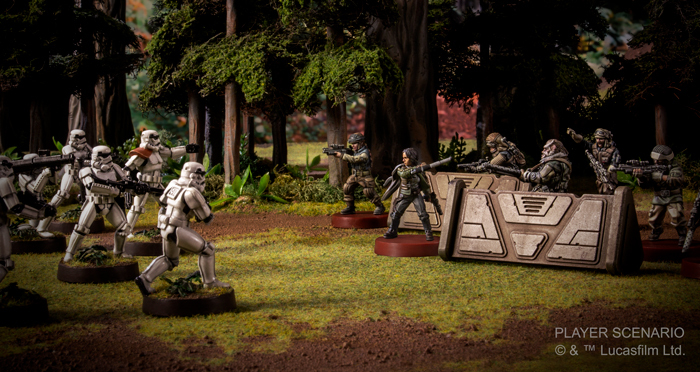 Erso herself may welcome suppression, but most other units aren’t so fortunate and a single attack from her Collapsible Tonfa can be enough to send some troopers into a panic. This melee weapon becomes even more versatile if Jyn Erso decides to show off her Rebellious side. 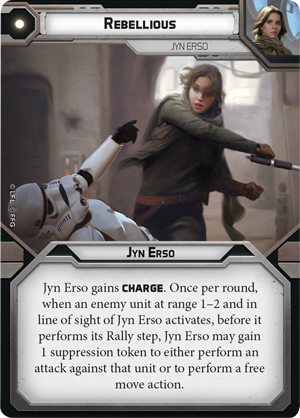 With this command card in play, Jyn can easily charge in and attack an enemy unit before it even performs its Rally step. But that’s not her only option. Jyn Erso is also fond of carrying an A-180 blaster and if she doesn’t want to take on that unit up close, she can make a ranged attack against that same unit using its Pistol Configuration, piercing through an enemy block in the process. If she’s too far away to make effective use of Rebellious, however, Erso can always choose to work alongside another unit. Not only does playing Trust Goes Both Ways help the units around Jyn Erso regain their composure, she also teams up with a friendly trooper that can also benefit from her Quick Thinking. In this situation, she’ll likely want to switch to the A-180 Rifle Config. This configuration might not be as accurate as the weapon’s pistol form, but it has a longer range, and its weaker dice can be compensated with any aim tokens that she's picked up. Jyn Erso may be accustomed to looking out for herself, but this all changes once she’s found a cause she truly believes in. At that point, she’ll do whatever it takes to Complete the Mission. 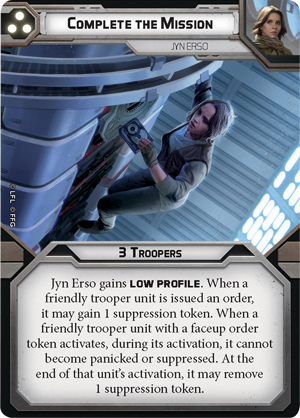 This command card sees Jyn Erso fully mature into a member of a larger team. In this case, she becomes even harder to hit, giving her the perfect opportunity to make a last ditch effort for an objective. The three trooper units she orders, meanwhile, become emboldened by her heroics. These units can raise their cover by gaining a suppression token when they’re issued an order and, no matter what happens, they’ll stay in the fight until the end. Reckless, aggressive, and fiercely independent, Jyn Erso eventually came to believe in the Rebellion. Now that she believes in the cause, she’s ready to do whatever it takes to ensure its survival. 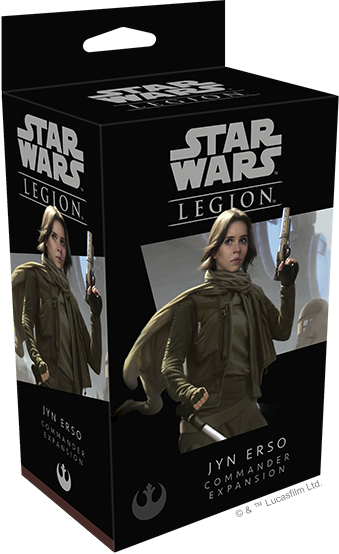 Look for the Jyn Erso Commander Expansion (SWL31) to release alongside the Rebel Pathfinders Unit Expansion (SWL32) at your local retailer in the first quarter of 2019. Pre-order your copy at your local retailer or online through our website here!